Puranik Builders have been building properties since ages. 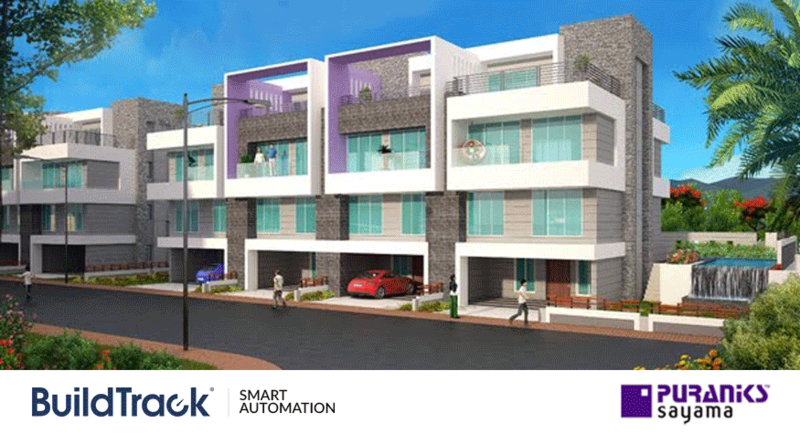 BuildTrack after bagging Puraniks Home Town project in Thane has got yet another chance to provide them with Home Automation Solutions for their Sayama project, Lonavala. Puraniks are a trusted name in the industry and provide a space that offers a perfect blend of all the modern amenities and comforts. It boasts of over 4,000 families residing happily with world class amenities and lifestyle. BuildTrack Home Automation System offered for the Sayama project luxurious villas includes products intended for safety, security, energy savings and convenience. It includes Remotes for lighting control, Gas Sensors for detecting gas leakage, Motion Sensors for energy conservation, Video Door Phones (VDP), Curtain Control, etc. Also the BuildTrack Smart App allows monitoring and controlling the entire villa on a Smartphone or a Tablet.